A story of how we receive so much from plants for health and nourishment, and one person giving back to the plants. August 29th 2016 - This is where I live. The summer and fall have passed with the most abundance of any year that I have lived in this part of Washington - orchard, garden, Salish Sea, and now the rains and long nights have returned to replenish and slow us all down up in the northwest. This is a story of how we as humans can work with and heal our plant brothers and sisters as they so readily heal us. This is a peach tree’s story. The peach tree on my property had not been doing too well since the first summer that my family lived here. I had figured that it was due to the buck that came along that summer and reared up to eat the peaches and break many of the branches. I kept hoping, expecting, as each spring and summer came and went that the peaches would return, but this never happened. I had heard that peach trees had only a 20 or so year life span, especially with the particular rootstock that I believed the tree had. I was going to give the tree one more year, and if it did not come back, I would cut it down and replant. I sat with my tree to understand whether it was time to turn her into firewood. I got back; use your feathers, your muvieris. About a week later, I skipped breakfast and brought my feathers down to the tree to see what would come forth. When talk up this way turns to fruit, vegetables and livestock, people are always surprised to learn that I have a peach tree. The locals all believe that they cannot thrive in the damp, cool environment. What I was getting from the peach was that there was some kinda of block around it. The tree was not being able to open up and really receive, that the environment had somehow shut it down. It was almost like the tree had gone into a deep protection mode just to leaf every year. I took out my feathers and started to work with the tree. After sometime, it felt better and I proceeded over to a couple of the apple trees that had not had the healthiest looking apples the past couple of years. It felt complete, and I waited for late spring to arrive. The pinkish/white flowers came forth from the tree in a beautiful manner and soon fruit was setting. Before long there was fruit all over the tree to an amount that I had never seen. Being on a part of the property that I do not often walk, I forgot about the tree until one day I went down to do some mowing around it and saw that the weight of the fruit was so great that several of the branches had snapped and many more were so heavy that they were on the verge of breaking. I quickly got out my orchard ladder to get up top of the tree and worked my way down thinning out the fruits. I pulled between 30 and 40 peaches off this tree and left them on the ground for the deer. In the previous 4 seasons I had not had that many peaches combined. I took note and watched the tree every few days as the fruit grew and ripen to make sure that the weight was not too great. I kept thinning the fruit over the next few months as they grew bigger than a baseball and juiced up. 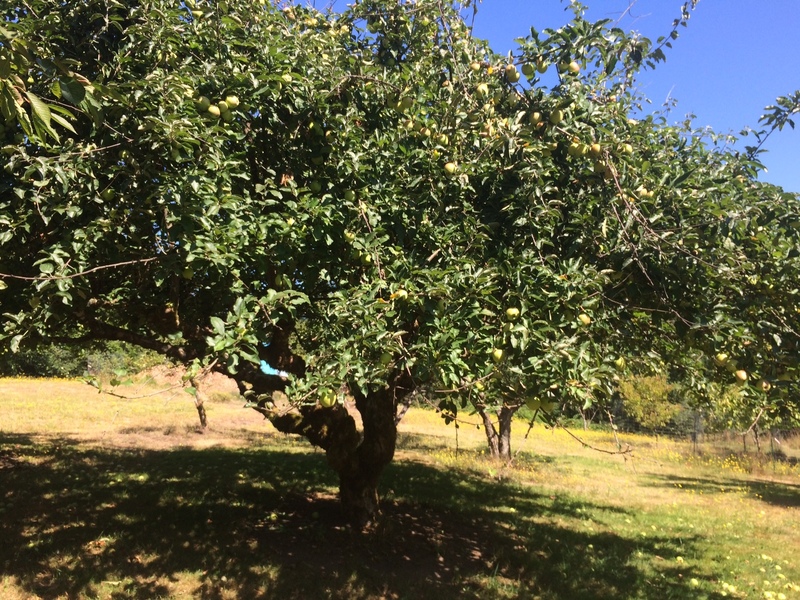 Over about a 3-week period as the fruit fully ripened on the tree, I kept picking the peaches to eat fresh, make into jam, pies and as an offer to clients who came as refreshment. I offered clients a short stroll to pick a juicy, sweet treat. All in all, this tree that had seemed destined for my wood stove produced better than the previous 5 years. It was beautiful, affirming and fun to see how our plant friends respond to our medicine as we do.